WWF’s conservation efforts in the Eastern Plains landscape has had a specialised focus on Law Enforcement. We have a team of dedicated guards who regularly patrol to combat illegal logging and poaching. Our rangers patrolled the landscape over 36 times in the last quarter, and analysed ways to block entry into the core zones through the key strategic zones and monitor the buffer zone that connects to the villages at Memang, Krang Chilork. 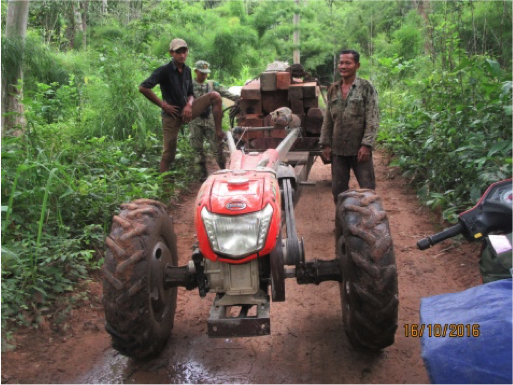 Our Phnom Prich Wildlife Sanctuary (PPWS) rangers removed 35 snares, destroyed 2 illegal camps, issued 4 warning letters, confiscated 37 logs, 2 poles meant to shock animals, 2 chainsaws and a cart. On 16 October 2016, after a brief rangers meeting, the guards set out according to their patrol plan. 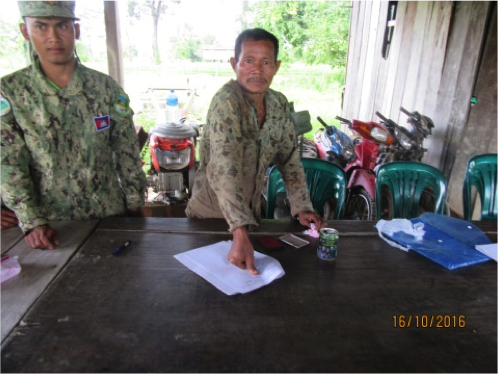 Our ranger at the Keropov outpost coordinated with the WWF law enforcement team to conduct a patrol at Keropov village, Soksan Commune, Koh Nhek District. They created roadblocks to prevent the entrance into the core zone. Our ranger arrested 3 suspects with one motorbike transporting 1 chainsaw and 1 machine cart transporting 37 old logs of luxury wood (Beng). Afterwards he escorted the offenders and the evidence to Keropove outpost, the ranger who is a judicial police officer filed the crime report and sent to the PPWS manager for further action. On the 22nd of October 2016, The rangers got reports from community members about snares and poaching at the Loaka outpost. The rangers then collaborated with community patrol team and a total of 14 people (4 rangers and 10 community members) set out on a patrol to remove snares inside the Srae Ey community protected area. The team cautiously approached the reported area Pre Cheung Chrey and caught 2 suspects red-handed. As the team was about to confront the suspects they took off and returned with rifles (AK47s.) They raised their guns and threatened the team, sensing how disastrous this situation could turn out, the WWF team and the community patrol officers retreated to a safe distance and captured evidence. It is important to note that even to this day, rangers don’t have a right to arms unless they become official MoE officers.